Switch with Wireless Extender. THA-101 is a combination smart electrical outlet and a powerful wireless extender which can be used to connect to existing wireless router and broadcasts a strong wireless network in low wireless coverage area of your home/office. 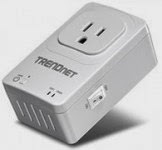 By using the TRENDnet mobile app, one can turn on and off a light, fan, electronic device, or appliance without straining themself. This home smart also allows users to schedule the turn on/off outlet according to their needs or to give an illusion that they are at home.